Dainichi All-Season to perform very well in maintaining vibrant colors of all koi varieties. This formula can be used in conjunction with all other Dainichi Koi Foods, however, it is especially beneficial during cooler weather when the koi's metaboloism is slower. A two-step application of vitamins and minerals, especially vitamins C & E, ensure that the luster, sheen and whites of your koi are always at their best. 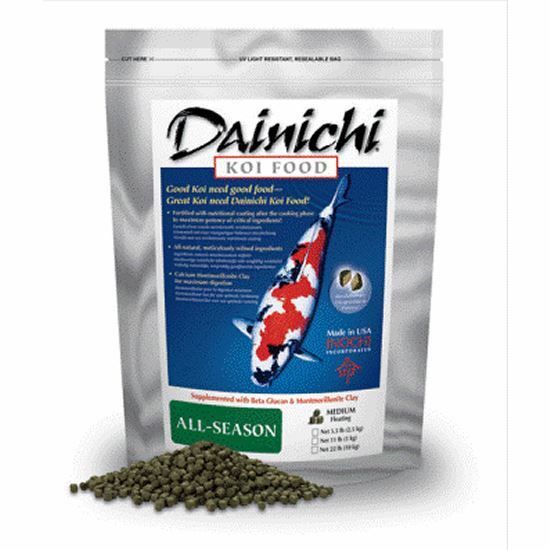 As with all other Dainichi koi foods, Dainichi All-Season contains calcium montmorillonite clay to simulate the natural ingestion of mineral particles and to bind and neutralize metabolic toxins. Raw, fully potent vitamins, digestive enzymes and garlic ensure that the fish are healthy and free of internal parasites. Furthermore, the scouring action of the clay enhances a continued rejuvenation of the digestive tract, which in turn ensures a maximum rate of digestion and assimilation of nutrients. With only two sources of starch (flour as binder and wheat germ as a source of vitamins E and B), Dainichi All-Season keeps the body conformation of all koi in a constant show-ready condition. As an addidional benefit, the low waste production by koi helps keeps the dissolved organics levels low in your pond, making it an invaluable aid in eliminating algal blooms. 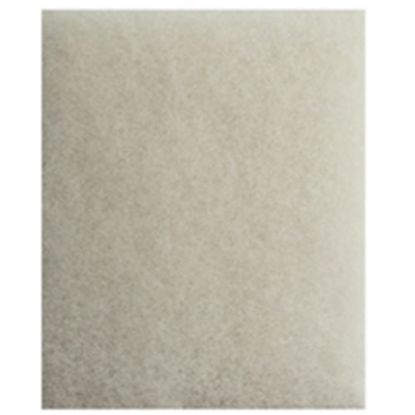 White fish meal, wheat germ, wheat flour, shrimp, soybean meal, brewer’s yeast, powdered milk, calcium montmorillonite clay, vitamin mix, mineral mix, spirulina, garlic, protease and natural gum. 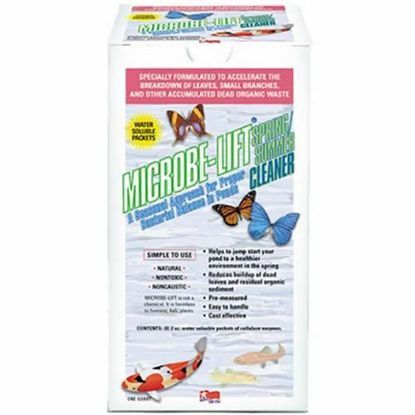 Microbe-Lift Spring Cleaner helps to jump start your pond in spring to a healthier environment by accelerating the breakdown of leaves, small twigs and other accumulated organic waste.